AHDD&F Veterinary Science College Warangal jobs 2017. 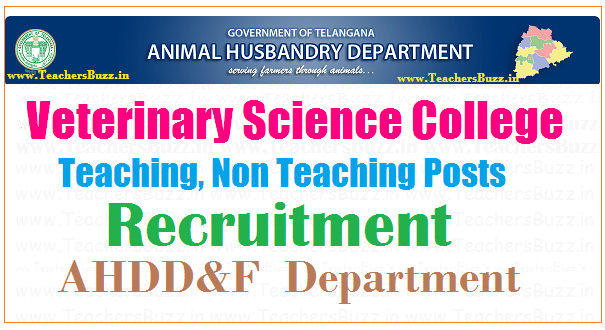 Telangana Animal Husbandry, Dairy Teaching, Non Teaching posts recruitment 2017 in Veterinary Science College, Mamnoor, Warangal. Animal Husbandry, Dairy(79) Teaching posts, (21) Non-Teaching posts on regular basis and (38) services on outsourcing basis in the College of Veterinary Science at Mamnoor, Warangal. Government of Telangana the AHDD&F Department shall obtain concurrence of Finance (HRM.II) Department before initiating measures to fill up the posts sanctioned for the direct recruitment of Associate Dean, Professors, Associate Professor, Assistant Professor, Administrative Officer , Superintendent ,UDC / Senior ,Assistant ,Farm Manager, Lab Technician, Cashier , Record Assistant,Stenographer/ PA, Farm Assistant, Vety. Compounder, Imaging Technician, Operation Theatre Technician ,Store Keeper, AV Technician, Computer Programmer, JACT/Data Entry Operator/Registration ,Assistant, Electrician, Museum Technician, Master Flayer, Operation Theatre Assistant, Multipurpose helpers in Class-IV category, Dresser, Shelf Assistant, Binder, Tractor Driver, Machine Operator, Games Boy, Marker, Photocopier Operator ,Plumber ,Pump set Operator, Gardenor Posts recruitment. Animal Husbandry, Dairy Development & Fisheries Department – Sanction of Teaching and Non Teaching posts to College of Veterinary Science at Mamnoor, Warangal – Orders - Issued. The mandate given to Animal husbandry department is to build the health of the nation by increasing the availability of Animal origin foods like milk, meat and eggs to human population through scientific breeding, feeding and disease management of livestock. Besides, it strives to improve the wealth of the nation by enhancing the animal productivity and their production. In addition, various livestock based poverty alleviation programmes are implemented by the Department. 1. Improving the production potential by way of breed up gradation in cattle and buffaloes through Artificial insemination. 2. Providing preventive and curative health care to livestock through constant vigil on disease outbreaks, rendering preventive vaccinations, deworming and treatment of ailing animals. 3. Augmenting fodder production to meet the nutritional requirements of livestock. 4. Providing relief measures to livestock during natural calamities. 5. Building awareness among farmers on profitable livestock production. 6. Coordinating with health department in controlling diseases of zoonotic importance. 7. Providing technical support to livestock based poverty alleviation programme. 8. Updating the skills of technical aswellas Para veterinary staff at regular intervals in the areas of scientific breeding, feeding and management of livestock. Animal Husbandry, Dairy Development & Fisheries Department – Sanction of Teaching and Non Teaching posts to College of Veterinary Science at Mamnoor, Warangal – Orders - Issued. 2. AHDD&F Dept., U.O.No.94/AH(3)/2016, dt.10.03.2017. 1. In the reference 2nd read above, the AHDD&F Department has proposed creation of (79) Teaching posts & (21) Non-Teaching posts on regular basis and (38) services on outsourcing basis in the College of Veterinary Science at Mamnoor, Warangal. 4. The AHDD&F Department shall obtain concurrence of Finance (HRM.II) Department before initiating measures to fill up the posts sanctioned in this order, wherever service rules prescribe direct recruitment. 5. The AHDD&F Department are requested to take necessary further action in the matter accordingly.